How Does Satellite Internet Service Work? Satellite Internet is a wireless communications technology. At the user’s end, a satellite modem is connected to a dish antenna. Signals are transmitted between the user’s dish and a satellite relay station up in the sky. 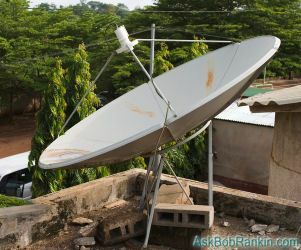 The satellite relays data to the ISP (Internet Service Provider) dish back on the ground; from the ISP’s hub, Internet traffic is carried via traditional terrestrial cables. There are pros and cons to satellite Internet. On the plus side, satellite Internet can reach remote areas where no other type of Internet access can go. Satellite Internet is moderately fast; consumer data plans range up to 25 Mbps. But there are limitations on the quality of satellite Internet. The geostationary communication satellites that are used for satellite Internet service are about 22,230 miles above the Earth. So your actual data path is four times that, or over 89,000 miles. Here's why: A request for a web page is sent from your computer to a satellite out in space. The satellite contacts the provider's Network Operations Center (NOC) which requests the specific web page you have requested. The NOC then sends that data to the satellite, which sends it to your computer. So there are four transmissions from or to the satellite. Even at the speed of light (186,000 miles per second) each request takes almost half a second (500 ms) to travel along that 89,200 mile path. That's a noticeable span when doing anything in "real time" such as playing a game, or having a voice conversation. This half-second satellite latency is imposed by the speed of light, but additional network latency can add to the problem of slow or stuttering performance. Weather can adversely affect satellite Internet, or knock it out entirely. When it’s raining, the microwave radio signals between ground and satellite are diffused and weakened, in what is called “rain fade.” Snowfall or dust storms can have similar effects. Even trees can affect reception of satellite Internet signals. The positioning of your satellite dish is critical to good Internet reception. If your dish gets knocked out of alignment, speed will decrease or you may lose Internet access all together. It may take a visit from a service technician to get the dish aligned properly again. Data caps are another potential drawback of satellite Internet. A satellite transponder’s bandwidth is limited, and it’s shared among many users on the ground. Bandwidth hogs who download excessive gigabytes of data during a billing period may be punished by overage charges, or by having their download speeds drastically reduced. The speed limit remains in effect until the next billing period starts. Similar to a cable Internet connection, bandwidth is shared in a pool of customers. So the actual upload and download speeds you experience on a satellite Internet connection will vary based on the number of people using the service at a given time. During peak hours, you can expect slower service. In the United States, there are just two primary satellite Internet access providers: HughesNet and ViaSat (formerly known as Exede). Other competitors such as WildBlue, EarthLink and Dish Network have either been purchased or discontinued. There are some small regional satellite internet providers, but HughesNet and ViaSat are the only remaining choices for nationwide service in the U.S.
Pricing between these providers doesn't vary a lot. HughesNet, for example, offers satellite internet at "Up to 25Mbps" with a 10GB data cap for $50 monthly. Other options include the 20GB plan ($60/month), 30GB plan ($90/month), and the 50GB plan ($140/month). HughesNet offers free installation, but charges $10/month to lease the satellite equipment. You do have the option to purchase the equipment for a one-time fee of $350. HughesNet has some data-saving features to help you stay within your monthly cap. It automatically compresses and optimizes web content, and lowers data rates for streaming video to 480p (DVD quality). If you do exceed your monthly data cap, you won't be cut off from the Internet. Instead, data speeds are reduced from your promised "up to 25 Mbps" to "1-3 Mbps" until the start of your next billing period. But if you're a night-owl, you can take advantage of the "Bonus Zone" which offers 50 GB/month of additional data to use during off-peak hours (2am-8am). ViaSat takes a similar approach, but with slower speeds for home users. Their low-end "Liberty 12" package gives you 12 Mbps download speeds with a 12GB data cap, and DVD-resolution (480p) video streaming. There's a "Libert 25" offering ($75/month) which gets you 12 Mbps download speeds with a 25GB data cap. The "Liberty 50" package bumps you up to 50 GB of data. All three plans come with a Free Zone (unlimited data from 3-6am). If you want download speeds faster than 12 Mbps, Viasat offers business plans with speeds up to 35Mbps, starting at $50/month. They also mention a plan that offers speeds of 100 Mbps, but I could not find pricing for that on their website. Viasat says that customers who use more data than their plan provides "will receive Liberty Pass for the remainder of their monthly billing period." That sounds like something good, but it's more like a speeding ticket. Liberty Pass speeds "will vary greatly based on the time of day and network traffic in your area, and may be "extremely slow when the network is busy, which may greatly impair internet usage." The folks at Reviews.com an extensive study on “The Best Satellite Internet” in August of 2018. They've rated the HughesNet and ViaSat satellite internet service options, with detailed “pros” and “cons” based on pricing, download speeds, technology, and customer service. Portable satellite Internet receivers are also available, but they provide much lower speeds and cost much more. Typically, only military, commercial maritime, or well-funded expeditions to the world's remotest regions use portable satellite Internet. However, you can rent mobile satellite internet equipment for short time spans at a more reasonable cost. Inmarsat offers packages that allow you to get online from almost anywhere on earth, but speeds tend to be only around 256Kbps. Satellite Internet beats dial-up, without question. If it’s the only high-speed option available to you, it’s worth the investment. Just don’t expect the same reliability and performance that you get in more populated areas where DSL, cable and fiber optic Internet connections are available. Most recent comments on "How Fast is Satellite Internet Service?" If that's all that is available, I'd not only would take it, I'd be happy. I've tried them all and Hughesnet is marginally better. I tried a higher end package for a while, but soon realized that only gave me a few days more of high speed so I switched back to the minimum package with the same high and low speeds. I love Netflix and Amazon Prime, but it is iffy. For the first few days of my billing period I get great reception without any stutter. After that the speed is theoretically fast enough for video streaming and sometimes it is, but many days I can't watch at all. They don't even sell DSL in my area any more and they discourage copper landlines, though I still hang on to mine for the reliability (cell service is also iffy here due to trees and distance to the towers), not the internet. Interesting....I knew I had a good deal but it's better than I thought. Where I live in rural VT a small local company offered a WI-FI internet hook-up. "IF" your location could "SEE" their tower. On the side of the MT. where I am, I could see it.My neighbors at the bottom of the road couldn't. I get download speeds consistently over 13 Mpbs and a monthly plan of 100 gigs for $60.00. Here in Canada we have Xplorenet, in Ontario i there is a plan giving unlimited @ (up to)25Mbps for C$110 per month. We have 3 receivers at work as it is our only choice for hi-speed. They also offer unlimited @ 5Mbps (C$40/mth) and 10Mbps for C$60/mth. 30 day free trial included! Viasat offers decent service, but they misrepresent their pricing. I got what I thought was going to be $109/mo, but it was actually $148/mo. If they had presented me with that amount in the first place, I wouldn't have gone with it. Back about 2003 we had a MotoSat Satellite system installed on the roof of our 40' motor home which we travelled all over our great country full time. It had a built in GPS unit so that wherever we stayed it was a matter of of turning it on and the dish rose up and adjusted itself for elevation and axis and when it found the Satellite did some tests and we were hooked up. With an attachment to the Arm we also got DirectTV. Those were the days that you had to go to the campground office to do email and surfing the Net was frowned upon.Never lost signal with the Dish. Was great but costs $$$$. As the years went by Campgrounds realized they had to offer something better than a telephone on the wall of the office, and started installing cable systems for not only internet but also giving or charging money for local TV. We eventually gave up that motorhome and the Sat installation went with it. By that time most campgrounds had wifi or cable available. At the time we had it installed and our life of mobility the MotoSat System was the cats meow. I have been using DishNet (which basically is HughesNet) for a number of years. Of course, it's so much better than dial-up but as others have indicated, it's iffy if you want to stream and the data for streaming is great so that even if I stream using Amazon Prime, the hit on my data is great. I have recently received a notice from AT&T that they are offering "Fixed Wireless Internet" for home users. The monthly data is currently 210 gigs which is much greater than my 50 gigs with Dish. They say download speeds are at least 10Mbps. My Dish is in the 20's so have to decide. It uses what they call a Wi-Fi Gateway. Cost is $50 for the first 12 months, then goes to the prevailing rate which is currently $70. This is still less than I pay Dish and 4 times the data allowance. I live in an area Verizon and Spectrum refuse to run cable. I have to use Verizon fios cell phone internet. I tried the sat internet and found them less than desirable. I don't like the cell phone internet either because of excessive costs but it beats the sat service as far as speed. Thank you for the article on satellite Internet. I worked as a volunteer at Federal parks. I saw that folks who wanted the internet used satellite. It is costly. Too bad the government can't better regulate Internet services so that service is better and charges aren't so excessive. Yeah, profit is good, but corporate gluttony has become excessive. Thanks, but I would like to know WHY Cable internet is so much faster. I have driven by their offices and seen large dishes. Don't they use satellite?? Wife and I had Hughes Net for years. one day I cut our land line and ATT said we were the only ones on our road that still used land line and since the line along the road was bad they would not replace. they offered home phone and internet for what we had been paying for land line alone. after just two weeks of ATT internet over cell signal we cancelled Hughes.Because we had purchased the equipment we were stuck with more obsolete electronics but thats okay. You are paying with these plans for an exact amount of hours and minutes, not from month to month. So, parents with kids have to monitor their usage. We have been using ViaSat for about 7 or so years now. There is no other possible provider (except Hughes of course) in our area. Cannot even get a landline. Overall it is OK. We try to avoid video as that will eat up our 12 GB very quickly. And once the cap is used, then I don't mind surfing Youtube. Our speed after the cap is used is OK usually, but every now and then it is slow. We actually listen to BBC and NPR radio a lot over the internet and only rarely have problems. We don't usually lose our signal due to weather. Figured out some years back that the signal problems we had were actually our WiFi. Put in an extender all the problems went away. Just wish they would double (or triple) the cap. The cap tends to discourage security updates so it is not good. Overall, we are satisfied. It is tolerable. Much better than driving a half hour to reach a local library for 1 hour of computer time! I have DSL (in the UK) so don't need to worry. But what I wonder is why satellite internet is less reliable and slower, as appears to be the case, than satellite TV? I have satellite TV and it is reliable and fast and never buffers. Maybe it's because of the nature of the internet (as Bob outlines above) - it has to travel four times between the user and the satellite? I’ve been using Satellite Internet for about 20 years; I began with Hughesnet when it was called Directway. I’ve run the gamut of bandwidth from 200 MB a day to 50 GB a month. A few months back I signed with ATT for their Fixed Wireless service, which allowed me 170 GB/month for $50/month for a year-long trial. I can now stream movies, which would have been too expensive with satellite. However, I ran into an issue when I lost ATT service for several days during the Mendocino wildfire. This left me blind and deaf, so I have kept Hughesnet as a backup. Also, I’ve found that the ATT service is quirky in its coverage. I’ve found places and sites that I either could not get or where the service was partial or intermittent, but where the satellite worked fine. Generally, I’ve found the satellite service pretty good and reliable, although it’s not as fast as advertised. Internet speed is spotty, likely due to weather or overburdening issues. Satellite is far better than dial-up and far worse than DSL or cable service available in most of California. I live in rural east TN. The only available internet at the time was Hughes Net and Via Sat. I chose Via Sat because everyone said it was the best of the bad.For 2 years I put up with service that continually dropped when it rained, and a 20GB data cap. Then I found that Verizon had a better program using wifi, at 40GB data cap, so I switched and it was very reliable, but expensive. More by accident I recently discovered that the government is pumping a lot of money into bringing high speed internet to rural areas. I found a wifi provider whose tower is in direct line of site with my house, $70 per month, reliable, at constant 25GB,and no contracts. It is more than enough for Netflix etc. It was only by accident I found this company but either cell phone wireless or if available,a wifi rural provider, is a far better choice than Hughes or ViaSat.